ACCESORIOS PARA MÁQUINA, HERRAMIENTA Y FERRETERÍA INDUSTRIAL. Empresa fabricante de morsas de banco, morsas para soldar en escuadra, morsas industriales para máquinas, mesas en cruz, morsas para caños, trípodes tristand, soportes para tubos, morsas de gran capacidad para ajuste de válvulas, tubos o accesorios, prensas tipo F, yunques o bigornias desde 15 kilos hasta 100 kilos, ruedas de acero con uno y dos rodamientos. MACHINES ACCESORIES, TOOLS AND INDUSTRIAL AND HARDWARE. 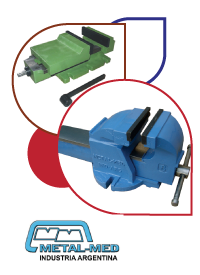 The company manufactures professional bench vises, flat and swivel vises, vises to weld at right angles, angle fixed milling vise, machine vise for shaping and milling use, precision cross tables, walruses for pipes, tripods TriStand, pipe supports, walruses large capacity to adjustment valves, pipes and accessories, type F press, anvils or bigornias from 15 kilos to 100 kilos, steel wheels with one and two bearings. Aim is the market is national and international (Mercosur). Its goal is to continue growing in these markets and its brand, METALMED, is been synonymous with quality.